Increasingly skeptical investor sentiment leads us to put Netflix (NFLX: $322/share) back in the Danger Zone. As we stated on CNBC’s Closing Bell on January 16, 2019, Netflix needs over 500 million subscribers at $20/month to justify $350/share. Without additional price increases, NFLX needs half the global population to sign up for Netflix. 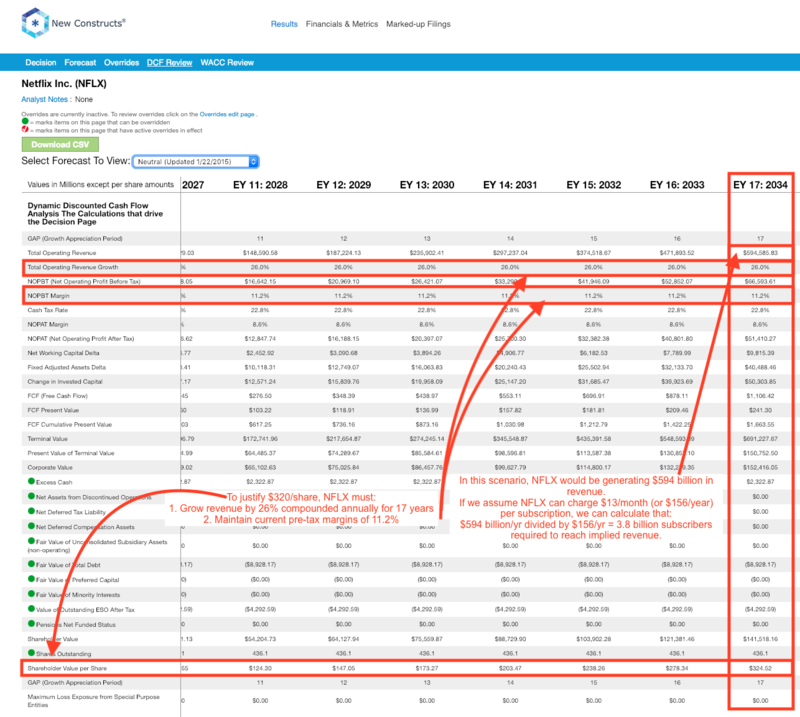 See Appendix I for the straight forward math behind this analysis and our reverse DCF model. We think these expectations are unrealistic, and the evidence backing up this belief continues to grow, as you’ll see below. Debt investors are not happy either. In fact, they’ve always been more skeptical and assigned Netflix’s debt “Junk” ratings since as early as 2015. In the last year, that skepticism has grown, as the yield on its issuances has increased 150 basis points. Since 2017, the cost of debt has risen 275 basis point to 6.375%. Should debt investors grow more weary of Netflix’s massive cash burn, the liquidity they’ve provided could dry up quickly. See Appendix II for more details. We put successful in quotes above because the mentioned shows have proven they can be monetized over many years. Not surprisingly, they’re produced by some of the top studios in the business, such as Disney. Can Netflix consistently provide better content than the rest of the industry for long enough to justify its current valuation? The evidence leads us to believe the answer to this important question is no. Scenario 1: Steady Growth – in this scenario, we assume Netflix can continue growing revenues at 26% a year (CAGR since 2011) and maintain current pre-tax margins of 11%. Such expectations are nothing to balk at, as even the most well run companies would be glad to grow revenues at such a pace for a prolonged period of time. Netflix would have to maintain this growth rate and margin for the next 17 years simply to justify its current stock price of $322/share. 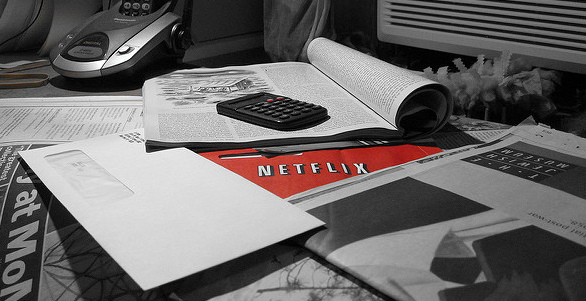 In this scenario, Netflix would be generating over $594 billion in revenue 17 years from now. Netflix would need over 3.8 billion subscribers at the current average price of Netflix’s subscriptions, which equals $13/month. See the math behind this dynamic DCF scenario. 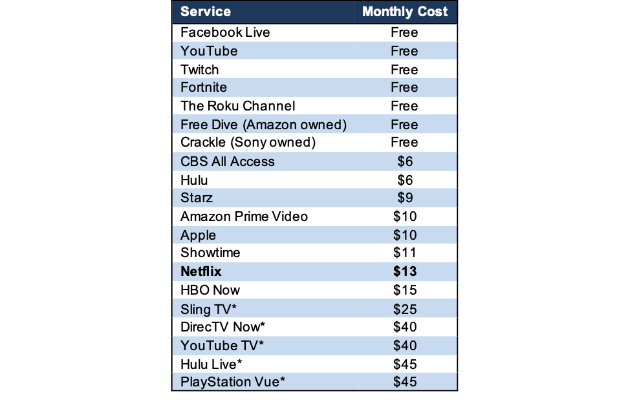 While we find it hard to believe nearly half the global population will sign up for Netflix, many believe Netflix can continue to raise prices and improve profitability, rather than go after 3 billion subscribers. We can also model such an optimistic scenario, as seen below. Scenario 2: Profitability in Line with Disney – in this scenario, we assume Netflix can grow revenues at 30% a year and more than double its pre-tax margin to 25%, which equals Disney’s 2018 pre-tax margin. Netflix would have to maintain this growth rate and margin for the next nine years to justify its current stock price. In this scenario, Netflix would be generating over $123 billion in revenue nine years from now. 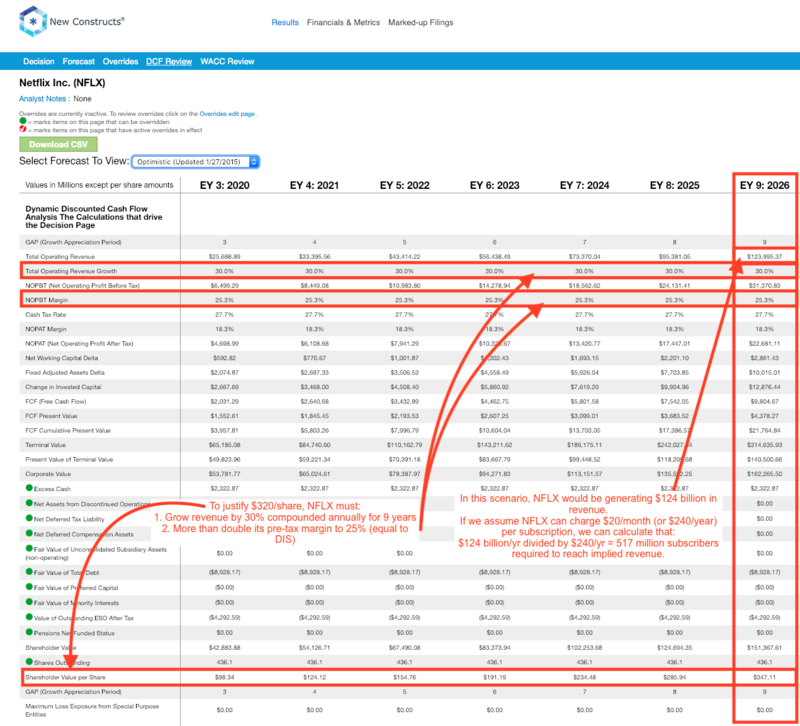 If we assume Netflix can increase its average price to $20/month, it would need 516 million subscribers to reach the revenue implied by this DCF scenario. See the math behind this dynamic DCF scenario. 2 replies to "Reality Is Closing in on Netflix"
Our household was an early adopter of Netflix (over Blockbuster) due to Netflix’ access to movies as soon as they were available on DVD. Now, AMZN offers streamed movies before NFLX, no doubt with the help of an extra rental deal on top of the subscription service (30 days to view the movie rental, 48 hours to complete viewing once started). Netflix sponsored one of the most critically acclaimed anime of 2018 “Violet Evergarden”. While I’m rooting for NFLX to be able to produce more, NFLX is losing the competition by mishandling rebroadcast rights. NFLX streams once an anime season concludes, while Crunchyroll (subsidiary of Warner Media [T]) subscribers can view new anime episodes hours after broadcast in Japan. Warner has also owned (but shuttered) DramaFever – a source for US viewers for K-drama (TV series produced in South Korea). We now use Viki (subsidiary of Rakuten) to view K-drama. The Disney deal is certainly a concern, but don’t discount the appeal of globally produced entertainment! I suspect the U.S. telecommunications company who can provide new domestic and international content as close to on-demand as possible will succeed. Great article and good summary! I agree (sadly) about NFLX, but recommend keeping an eye on T.